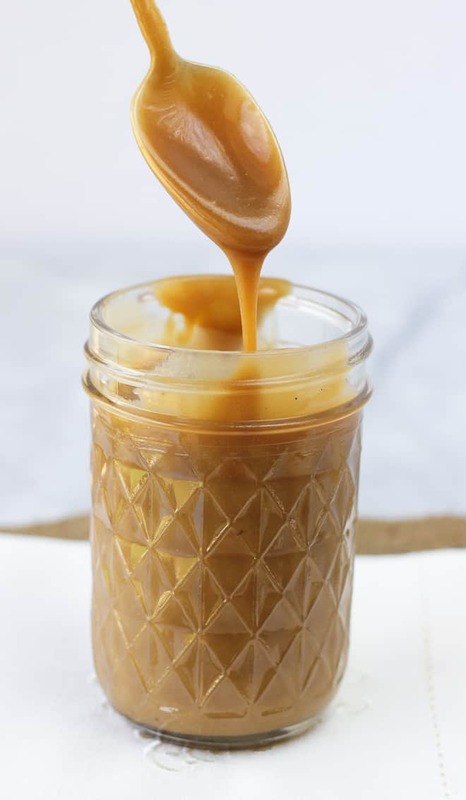 Caramel sauce is a treat I love to make during the holidays. Or anytime really! When put into small jars with cute labels, it makes for a great food gift. I love it folded into banana cream pie, baked into carmelitas, poured over fresh apple pie, or just for dipping apples! Look for a gluten-free, dairy-free carmelitas recipe here soon! Caramel sauce is also another thing I wanted to recreate to be dairy-free and refined-sugar-free. 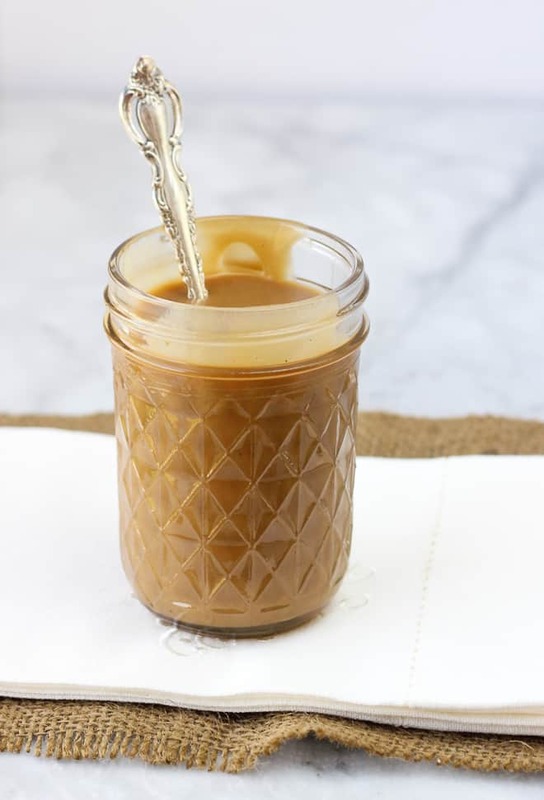 This caramel sauce is as delicious as any I’ve ever had! You would never guess it’s dairy-free. It is smooth, rich, and creamy. Not to mention, it is a cinch to make. I love the taste of salted caramel, so I always put a good pinch of salt in it. Caramel and apple just go together! This sauce was so delicious over a flat apple pie I made this weekend. Since it is a necessary ingredient for so many of my favorite things, I’m happy to have this caramel in my life! Place a can of coconut milk in the fridge for at least 4 hours. This allows to coconut milk fat to separate from the liquid. After it is chilled, measure out 3/4 cup of the solid part. Place the coconut milk fat, honey, palm sugar, and salt in a saucepan. Bring it to a boil over medium heat, stirring occasionally. Reduce to a simmer and simmer for 10 minutes. Remove the mixture from the heat and stir in the ghee and vanilla extract. The caramel will be dark in color, but will lighten up as it cools. Place in a jar and refrigerate until cool. The caramel will keep in the refrigerator for 1 week. Give it a good stir before serving. Enjoy! Lately I’ve been using Trader Joe’s Coconut Cream with great results! Be sure to use palm shortening if you want this to be dairy-free. I use ghee because I have a sensitivity to casein, and ghee is lactose/casein-free. Perfect! It looks so yummy! I really must try this recipe. 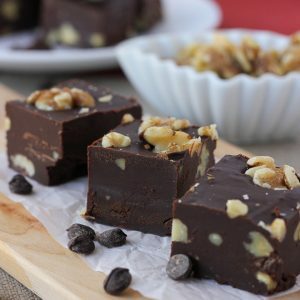 Thank you for sharing these great recipes! very nice recipe, great flavour and consistency and colour, but you might want to note that it is not dairy free if you add butter or ghee. I’ve used vegan non dairy guten free butter smart balance turned out great. Yessssss finally a healthier caramel sauce, thank you!! Wow – this looks amazing! I’m going to try it for a dessert I’m making for a kids party. We’ve got allergies to manage so I’m going to have to check out your other recipes for more things to try. I want to make this for a healthier Halloween treat and send it to my daughter away at school. Will it keep for the few days it will take to get to her in the mail w/o refrigeration? She can refrigerate it once it gets there. Unfortunately I don’t think this will keep well in the mail! It needs to be refrigerated. Sorry about that! I would love your recipe for the flat apple pie too! Is it normal for this to separate in the refrigerator? There are two layers?!?! This can happen depending on the brand of coconut milk you use. Just give it a stir and it should be still be great! And the nutrition values are. …..
Hi! Can’t wait to try this out. Was wondering what your symptoms were for the casein sensitivity? I have an issue with cow milk that causes initial nasal stuffiness then full blown post nasal drip (thickness depends on how much milk I had, sorry if TMI lol) but goat milk doesn’t bother me. Doesn’t matter if the cow milk is processed, fermented or whatever. Except for butter. Butter doesn’t bother me like milk, yogurt, kefir, etc. Thanks for the recipe and the feedback on this post. My son is allergic to the casin in cows milk and like you he can have goats milk without any problems. Also like you, when we first realized he was allergic, be would get a stuffy nose and a scratchy throat. As time went by the symptoms got worse and he started to have severe and uncontrollable mood swings. It has progressed to the point where the doctor fearss that his next reaction could be anaphylactic and has given him an Epipen. He also has no problem with butter. According to our allergist it is because butter is just the fat from the milk, the casin is in the whey which separates out when butter is made. “I knew I loved you before I met you!” Lol:) This is the recipe I used when making caramel for a cake I wanted Kenny to be able to eat during one family celebration a long time ago! Amazing recipe and so easy to eat by itself! Thanks for your hard work! I see in your notes you started using trader joe’s Coconut cream instead of separating the milk. Did you use 3/4 cup of the cream? Or did you change the amount? Hi, thank you for your recipe! It looks awesome! I’m planning on making this but I only have regular sugar, will that work?